What does it mean to disable pinning on certain images? 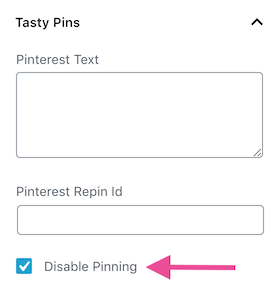 Learn what the "Disable Pinning" feature is all about and what it can do for your blog. Not all images are perfect for Pinterest. Give your readers fewer, better options for saving to Pinterest by disabling Pinning on certain images. Disabling Pinning prevents pin hover buttons from showing up on that image. It also prevents the image from appearing in the multi-select Pinterest modal window. To disable pinning on any image, check the "Disable Pinning" box in the block sidebar for that image. If you want to disable pinning on an image already added to a post, simply select the image in the post, click the pencil icon, and click the "Disable Pinning" box in the dialog that appears. Wondering how to disable pinning on images outside the content? Learn about what Tasty Pins can do.